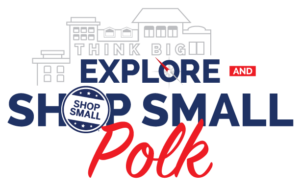 Whether you’re an individual or a business, there are a bunch of ways to become involved and support Shop Small Polk. Your first step? Read below and then take the pledge. All it takes is changing a single monthly purchase to support a business you believe in. If all of us changed just one $50 monthly buying decision to support a local business, it would add up to $24.6 million to our local economy every year! If all of them changed just one $500 monthly buying decision to support their local business friends, it would add up to $22 million to our regional economy each year! Our vision is for everyone – consumers and businesses alike – to consciously choose goods and services that will strengthen our regional economy. With your support, we can make some waves! There’s no catch. No fees. No hoops. Simply click the button below to take the pledge and we’ll make it known that you’re a Shop Small Polk participant! Businesses and individuals alike can pledge to make a difference–even if it feels like a small, inconsequential one–on Shop Small Saturday. Every Small Purchase Makes A Big Difference!